The Beginning: Our original 1992 Green Apple Map projects gave users a unique sustainable perspective and provided a view unlike any other map of this city. While initiating the global Green Map project became the priority, mapmaking in NYC took a break. There was a five-year gap between editions, although our site data collection kept growing. The third citywide edition of the Green Apple Map was our first to use the newly minted global Green Map Icons (Copenhagen's 1996 edition was the first published using them). We partnered with Metropolis Magazine for this edition because we admired their approach to sustainability and they would help us reach an important demographic - the designers and decision-makers shaping our cities and lives. We did all the research and site collection, and Metropolis staff took care of the most the design and fundraising, and helped with the editing and outreach. 65,000 free copies were printed in March 1997, roughly two-thirds went to Metropolis' regional subscribers, and the rest were distributed through Greenmarkets, events, green shops, gardens, etc. A year later, the demand for the map kept growing, and the map was revised (over 100 changes) and reprinted by Metropolis. We did more of the distribution this time. It had a rather clumsy numbering system that matched our first online interactive Green Apple Map (it debuted in spring 1998 and lasted about 5 years before its underlying technology became obsolete). Around this time, we also added travelogues and began working with local schools and groups on their own Green Maps, and began the process of developing educator resources. By the turn of the century, the global Green Map network had reached 100 projects, and 36 unique Green Maps were published! 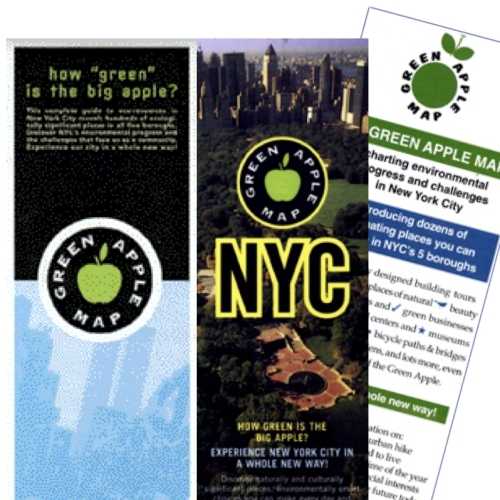 In 2000, we created an all new edition of the Green Apple Map, with printing supported by Earth Day New York, who distributed 65,000 of the 100,000 copies! Will van Roden, by then Metropolis' former art director, designed this edition, too. There were so many new sites in town that the map was quite crowded - we decided the next Green Apple Map would be our first thematic edition (the result was the energy themed Powerful Green Map), and to experiment with a 'close up' view of a part of the city (the result was 2001's colorful, youth-centric LoMap). There was a wonderful response to our 2000 edition, and many requests for copies, long after we had run out. Later, we re-branded Green Apple Map as Green Map NYC, to harmonize better with our global brand. This interactive NYC Open Green Map has most the data from these maps (sorry, outdated!). 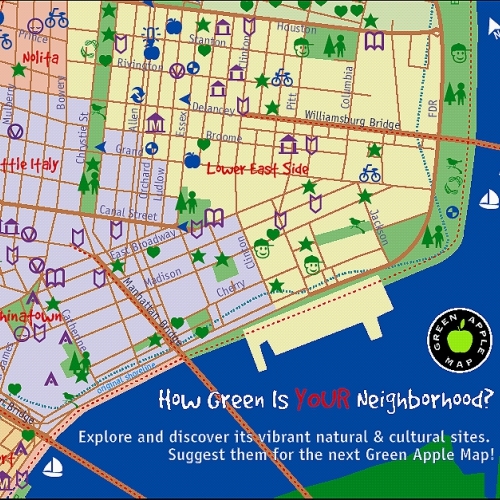 You can download PDFs of these Green Apple Maps on our New York website, GreenMapNYC.org, or explore an overview here.